Ten ventures took the stage early last month for the PitchNOLA: Education 2016 competition. So many factors played out in the win, but the amazing story of Hazel Smith helped carry the night and earned Electric Girls $5,000 for empowering young women as leaders through science and technology education. Smith is a young girl who participated in an Electric Girls five-week seminar. In the beginning, she was shy, and not knowing a thing about electronics or computer programming, she struggled with the material. With each weekend, her confidence grew and her interest bloomed. Fast forward to the summer, and Hazel became a very young (15 years old) but extremely capable and highly rated counselor for the Electric Girls summer camp. She joined her school robotics team and was promoted to a leadership position. Just this fall, she was recognized with a Woman of the Year in Technology Ada Lovelace in-training award and had scientists and engineers inviting her to their labs. Now she spends all her Saturdays volunteering as a peer educator for the Electric Girls program and is an unofficial advisor for the program. 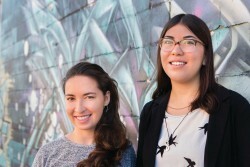 Serna and her assistant director, Maya Ramos, intend to use their winnings to continue to ensure that at least 50 percent of Electric Girls’ students receive scholarships. “Our whole purpose in the broadest sense possible is equity … getting women to feel like they belong and are capable of pursuing technology,” Serna says. And, she says, that would be pointless if it weren’t applicable to all women. Serna and Ramos anticipate that their typical waiting list of 15 to 20 scholarship students for each seminar will be reduced thanks to the award. The programming for Electric Girls consists of five-week seminars at Delgado’s NOLA FabLab, covering the fundamentals of circuits, wiring and computer programming. Participants bring all that knowledge together and are given freedom to create projects with their choice of lights, motors, buzzers, sound and more. An all-female staff of volunteers and members of the Tulane Society of Women Engineers leads the sessions, and previous students act as mentors, while, at the same time, learning more advanced concepts. Parents get a show-and-tell demonstration on the final day of class and an introduction to the basics as well. Additional fun is scheduled through a full summer of one- and two-week camp sessions, and there are fiber-optic costuming design days (this year for Halloween and Mardi Gras). Ramos is still a Loyola student earning a double major in music industry studies and piano performance, while Serna, in addition to running Electric Girls, also works part-time as the director of the production studio and Mobile Idea Lab at St. Martin’s Episcopal School. Both musicians and sound engineers, they spend precious free time on either side of the recording studio booth. So … busy much? Yes. Thoroughly engaged? Ditto.